Will 2016 Set Satellite Records? (Now Includes June and July Data) | Watts Up With That? The above bar graph shows the RSS bar heights for 2016 in blue and the corresponding heights for 1998 in red. For January, February and March, the blue bar is higher than the red bar indicating that for these three months, 2016 was warmer than 1998. 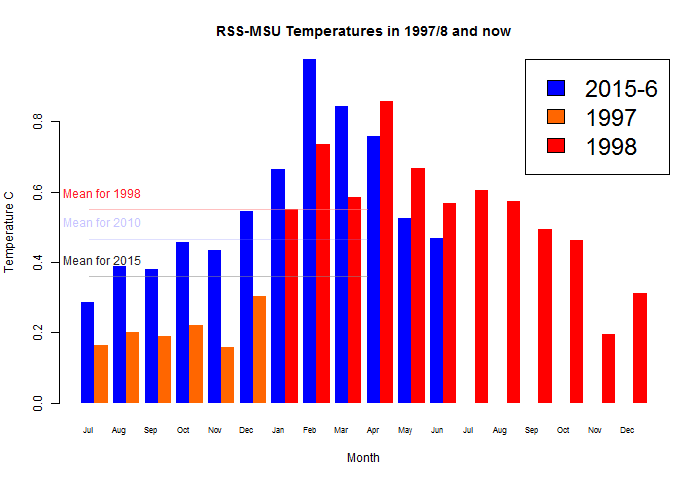 However since April, the blue bar is lower than the red bar indicating that for these months, 2016 was colder than 1998. Note that the July 2016 anomaly is already lower than that of several later months in 1998. In this respect, RSS is the same as UAH6.0beta5 which, among other data sets, can also be viewed on Nick Stokes’ site. In order to answer the question in the title, we need to know what the cumulative lengths of the blue bars above the red bars will be for all 12 months. If blue is higher, 2016 sets a new record. If red is higher, the 1998 record stays. Before going on, I just want to be clear I am talking about a calendar year record. For both satellite data sets, the monthly record high anomaly prior to 2016 was in April of 1998. As well, for both sets, this was beaten in February of 2016. There are many similarities between 1998 and 2016 on both data sets. Both were influenced by an extremely strong El Nino which caused records to be set in the beginning of the year. Then there was a drop in 1998 and so far, there is a similar drop in 2016. However there are important difference between 1998 and 2016. In 1998, the highest anomaly was in April of 1998 and therefore not surprisingly, the second quarter of 1998 was the quarter with the highest anomaly. In contrast, the highest anomaly in 2016 was in February making the first quarter of 2016 the one with the highest anomaly. The difference between quarters 2 and 3 for 1998 for UAH6.0beta5 was 0.165. The difference between quarters 1 and 2 in 2016 was 0.169. This is very close! The difference between quarters 2 and 3 for 1998 for RSS was 0.140. The difference between quarters 1 and 2 in 2016 was 0.245. While this is not as close as for UAH6.0beta5, I will make similar calculations. There are several different approaches one can use to arrive at the best guess as to whether or not 2016 will set a record. I have decided to give a table with the averages for RSS and UAH6.0beta5 by giving the averages for each of the four quarters in 1998 and the first quarter of 1999 as well as the four quarters of 2016. The first quarter of 1998 will be called 98(1), and so on. Obviously, I can only give the first two quarters of 2016 and I will have to estimate the last two. Feel free to comment on whether you think my methods are good or whether you think they are out to lunch. For each of the two satellite data sets, I took the difference between the following quarters: 4 and 3 of 1998, and 1 of 1999 versus 4 of 1998. Then I applied those differences to quarters 3 and 4 of 2016 and put those numbers in ( ) on the table for 16(3) and 16(4). Then I calculated the averages for 2016 based on those numbers and compared those to the 1998 and 2010 averages which are ranked first and second at this time on both sets. You can see how the projected 2016 anomalies compare to the first and second place years in each case. Below is the table described above. According to my calculations, 2016 should come in at second place in both satellite data sets. However for RSS, it may even come in at third place. For some anomalous reason, the anomalies for both RSS and UAH rose in July as compared to June. However that does not affect my conclusions going forward. It should be noted that both July anomalies are still way below the April, May and June averages in both cases. It should also be noted that the present July anomalies are still lower than at least the August and September 1998 anomalies for both data sets. In the sections below, we will present you with the latest facts. The information will be presented in two sections and an appendix. The first section will show for how long there has been no statistically significant warming on several data sets. The second section will show how 2016 so far compares with 2015 and the warmest years and months on record so far. For three of the data sets, 2015 also happens to be the warmest year. The appendix will illustrate sections 1 and 2 in a different way. Graphs and a table will be used to illustrate the data. The two satellite data sets go to July and the others go to June. On several different data sets, there has been no statistically significant warming for between 0 and 23 years according to Nick’s criteria. Cl stands for the confidence limits at the 95% level. This is 23 years and 1 month. For RSS: Since December 1993: Cl from -0.025 to 1.740 This is 22 years and 8 months. For Hadcrut4.4: The warming is statistically significant for all periods above three years. For Hadsst3: Since October 1996: Cl from -0.002 to 2.130 This is 19 years and 9 months. For GISS: The warming is statistically significant for all periods above three years. This section shows data about 2016 and other information in the form of a table. The table shows the five data sources along the top and other places so they should be visible at all times. The sources are UAH, RSS, Hadcrut4, Hadsst3, and GISS. 1. 15ra: This is the final ranking for 2015 on each data set. 2. 15a: Here I give the average anomaly for 2015. 3. year: This indicates the warmest year on record so far for that particular data set. Note that the satellite data sets have 1998 as the warmest year and the others have 2015 as the warmest year. 5. mon: This is the month where that particular data set showed the highest anomaly prior to 2016. The months are identified by the first three letters of the month and the last two numbers of the year. 7. sig: This the first month for which warming is not statistically significant according to Nick’s criteria. The first three letters of the month are followed by the last two numbers of the year. 8. sy/m: This is the years and months for row 7. 9. Jan: This is the January 2016 anomaly for that particular data set. 10. Feb: This is the February 2016 anomaly for that particular data set, etc. 16. ave: This is the average anomaly of all months to date. 17. rnk: This is the rank that each particular data set would have for 2016 without regards to error bars and assuming no changes to the current average anomaly. However as this post makes clear, I do expect changes. Think of it as an update 30 minutes into a game. For UAH, version 6.0beta5 was used. Note that WFT uses version 5.6. So to verify the length of the pause on version 6.0, you need to use Nick’s program. To see all points since January 2015 in the form of a graph, see the WFT graph below. Note that UAH version 5.6 is shown. WFT does not show version 6.0 yet. Also note that Hadcrut4.3 is shown and not Hadcrut4.4, which is why many months are missing for Hadcrut. As you can see, all lines have been offset so they all start at the same place in January 2015. This makes it easy to compare January 2015 with the latest anomaly. The UAH average anomaly so far for 2016 is 0.585. This would set a record if it stayed this way. 1998 was the warmest at 0.484. Prior to 2016, the highest ever monthly anomaly was in April of 1998 when it reached 0.743. The average anomaly in 2015 was 0.262 and it was ranked 3rd. For RSS: There is no statistically significant warming since December 1993: Cl from -0.025 to 1.740. The RSS average anomaly so far for 2016 is 0.672. This would set a record if it stayed this way. 1998 was the warmest at 0.550. 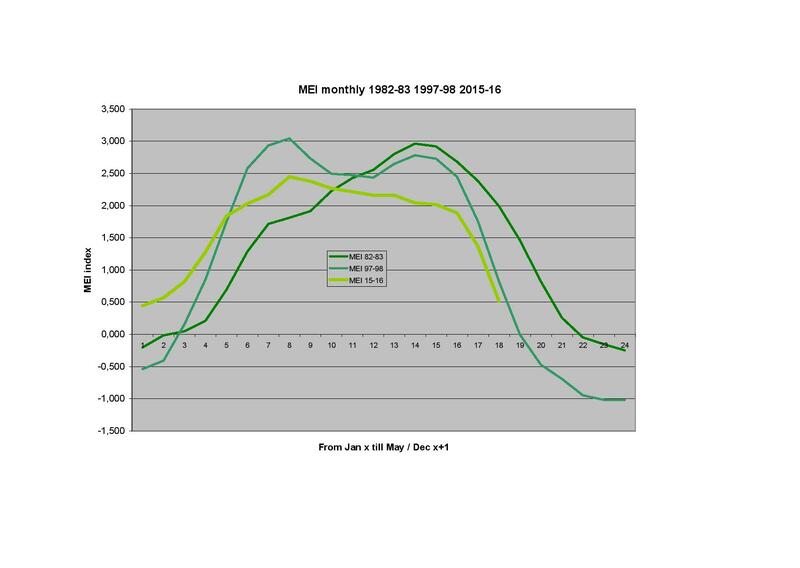 Prior to 2016, the highest ever monthly anomaly was in April of 1998 when it reached 0.857. The average anomaly in 2015 was 0.358 and it was ranked 3rd. For Hadcrut4: The warming is significant for all periods above three years. The Hadcrut4 average anomaly so far is 0.896. This would set a record if it stayed this way. Prior to 2016, the highest ever monthly anomaly was in December of 2015 when it reached 1.010. The average anomaly in 2015 was 0.746 and this set a new record. For Hadsst3: There is no statistically significant warming since October 1996: Cl from -0.002 to 2.130. The Hadsst3 average anomaly so far for 2016 is 0.648. This would set a record if it stayed this way. Prior to 2016, the highest ever monthly anomaly was in September of 2015 when it reached 0.725. The average anomaly in 2015 was 0.592 and this set a new record. For GISS: The warming is significant for all periods above three years. The GISS average anomaly so far for 2016 is 1.10. This would set a record if it stayed this way. Prior to 2016, the highest ever monthly anomaly was in December of 2015 when it reached 1.10. The average anomaly in 2015 was 0.87 and it set a new record. In my opinion, only two things can prevent both RSS and UAH6.0beta5 from retaining their 1998 records. One is that the present downturn in ENSO numbers suddenly reverses to develop into an El Nino again. The other is that a new and revised data set will come out from RSS. And should that happen, what are the chances that 1998 gets hotter and 2016 gets colder? Will the massive cloud seeding going on, and the “persistent contrails” that also seem to create clouds, not affect the satellite measured temperatures? The number of aircraft flying at height (in the contrail levels) is not significantly different between 1998 and 2016. The efficiency of those aircraft has altered considerably with a lot more twin jets and considerably reduced fuel burn therefore emissions reduction – in particular water vapor. It may well be that any small increase in aircraft operating is balanced by the reduction in water vapor emissions. Contrails are only persistent in humid air usually with supercooled water vapor. The added water vapor from the aircraft exhaust that condenses into the con(denstation) trail may trigger the supercooled water already in the contrail layer to itself form ice crystals. If there is insufficient water vapor then the contrails themselves sublimate back to water vapor and the contrail is ‘non-persistent’. If the air is even drier then the contrails will not form as the water vapor does not condense out. In consequence the contrails are an indication of the humidity of the contrail layer and the amount of supercooled water vapor there is at those levels. On days with low humidity at height you will not see contrails, but the airlines are still flying. So it could be possible that during this warm period of the last 40 years that contrail watchers are seeing more long lasting contrails due to a slight increase in humidity? Goldminor, I’d also add a colder stratosphere to that thought. As the msm have been announcing already that 2016 is hotter than ever, the data will not make any difference to the message .Good news doesn’t sell papers. Warmer earth is a very good news. Colder earth is a very bad news. Yes, and this is the message that needs to get out to the general public. Warmer is better. Neither vukcevic nor Tom seem to imagine that more warming might, here and there, lead to significant cooling. E.g. in the northwest Atlantic where warming leads to increased ice sheet melting (about 200 Gt/year in Greenland), what leads to an increase of unsalted water in the ocean. That phenomenon is known as a source for perturbations in the thermohaline circulation, whose first consequence is a southwards retreat of the Gulf Stream. Should this really happen: bad news for Western Europe over the long term. Please tell us when that last thermohaline circulation change occurred. when you talk about the thermohaline circulation, the current bigger melts of the arctic are in fact a good thing: it’s actually the cycle of the melting and refreezing sea ice that creates the saltier water that is sinking down. in short greater arctic ice swings do ironically make the thermohaline circulation flow faster. second the gulf stream is not changing, the input is ways to small. you need a serious meltwater pulse to alter the gulf stream’s path. (at least to create the disasters shown in “the day after tomorrow” movie. the worse that can happen with the very steady warming we see is a small change, in the order of AMO-NAO gulf stream pattern changes, but that’s not catastrophic. i’m more convinced that the coming solar low paired with an AMO that will flip into negative will cause the cooling on global level. The Greenland’s ice melt is a summer effect and I am not aware of any indication that the Gulf stream slows down as a result of it in the late summer and the early autumn months. Younger Dryas. Abrupt climate change suspected to have had the same origin (alas I lack the time to search for appropriate lit sources). Yeah. Thought so. Wasn’t there a massive, multi-billion cubic kilometer of “frozen ice and dammed up ice water” right over the inland north America at that time? Seems like you cannot project the effect of a sudden melting and release of a billion cubic kilometers of inland fresh water into the future catastrophe of changing the current circulating currents near Greenland … if there is NO inland fresh water now available to to be released! Oh wait! This is CAGE environmentalism. There ARE no rules. Only government-paid bureaucrats getting paid for publishing more papers to publicize for their government to justify their desire for more money. Correct, RA! I had read about that event somewhere but forgot it. Any reassuring info is a good info. Yea, have you spent about 500 hours research at the NIPCC site, (climate change reconsidered) There and another 200 plus hours at CO2 science, and you will feel greatly reassured. Maybe J Bastardi (if he sees this) can post the NCEP CFSR/CFSv2 temp anomaly chart compiled by R Maue behind the WxBell paywall. Since it is a compilation of all the global temps every 6 hrs used to initialize the weather models, to me it is the best approximation to global temps available. They can’t fudge the numbers or the models will be screwed up (more than normal). For this cycle it peaked on March 1st at +1C, dropped to +.25C on June 15th and has risen back to +.35C today. Certainly not “we are all going to die” temps. Maybe J Bastardi (if he sees this) can post the NCEP CFSR/CFSv2 temp anomaly chart compiled by R Maue behind the WxBell paywall. Hey, thanks for that link. It sure seems counter to everything we expect from a La Nina! The news is this year will be another in the conger line of hot years. Kind of beginning to look like a trend to me. Hope it’s not because if it is contrails are the least of our problems. tony, please don’t extrapolate your bedwetting problems to the thinking population. …. and it’s conga not conger. A conger is a type of sea-dwelling eel. Maybe he’s using eels as a temperature proxy?? Pssst tony- that’s conga line. Can’t you even get that part right? At least he didn’t say “congo line”. The alarmism is completely unwarranted Tony. Right, thanks, conga line of temperature records. I suppose that means my bed linen will dry out faster at least. Records based on a select period of time which is meaningless even if it were to happen. Records that if they were to happen would pail to earlier warm periods in the Holocene such as the Holocene Optimum , Minoan Warm Period , Roman Warm Period , and Medieval Warm Period. This period of time(modern warm period) in the climate is NOT unique and is about to end and does not change the trend in global temperatures since the Holocene Optimum which is a gradual down trend with spikes of warmth including this latest modern warm period. So if a record should or should not occur it is meaningless and if it should occur it would be tied to El Nino 100%. and again a record over a select short period of time. My point in the data provided in the above article. Dr. Roy Spencer has this graph. It shows the trend necessary for this year to be a record. The required trend looks unlikely. I am pretty sure the second graph at this post was intended and I completely agree that the cooling over the next five months will be greater than needed to maintain the 1998 record. You’re right. I thought I could link directly to the graph but I was wrong. Werner provides a working link. As he points out the second graph is the one I intended. CB – your original link worked for me. One of the big differences between 1998 and 2016 is the amount of Arctic sea ice. The current lack of ice allows significant warming of the Arctic air in the winter from the open water. This is why the 2016 winter months surpassed 1998 but fell below 1998 as we moved into spring and summer when the difference in air and water temperature is not significant. The big question will be what happens with the ice as we move into the fall this year. If we get closer to normal ice then 1998 should remain the warmest. However, if we have a slow freeze then 2016 could win out. However, if we have a slow freeze then 2016 could win out. Thank you for your comments. While different Arctic conditions would certainly have an effect, the ENSO numbers are also very important. While they have stalled at -0.6 or -0.5 over the last 4 weeks, they are still dropping month by month since December 2015. So we still have 3 or 4 months of cooling “in the pipeline” regardless what the ice may do in the fall. There is also a difference in the time of year when the two El Nino’s peaked. The 3 month lag of the ENSO to temperatures means that 2015-16 temperatures peaked earlier than 1997-98 and is now going down faster because on the one month difference. A small issue but one can see it the numbers/chart in the head post. It’s interesting that whilst UAH might not set the record for an individual calendar year, 2015/2016 is certain to be the warmest two consecutive years in its record. Good point! Actually that is already the case. WFT only does 5.6, but look at the plot from 1997 with a mean of 24 months. The warmunists have created a “climate crisis” out of thin air by speculating about the average temperature 50 to 100 years into the future. They have been making wrong climate predictions for 40 years. The lesson learned is that humans don’t know enough about what causes climate change to predict the future climate. Even if we did understand what causes climate change, the causes may be random non-cylical events that still could not be predicted. This article attempts to predict the average temperature in 2016 before the year ends. The author does not seem to realize he can’t predict the future climate. He seems to be a smart guy — I wonder if there are other aspects of climate change he is interested in? Predicting 2016 when the year is more than half over, may seem like a useful thing to do, but is not. That would be useful, I suppose. But this article, I’m sorry to say, is statistical mass-turbation serving no apparent purpose. It doesn’t matter if 2016 is the warmest year, or second warmest year, or third warmest year, in the satellite era. If one applies reasonable margins of error to the data, such as +/- 0.3 degrees C., the order would change. Earth has been in a gradually warming trend since about 1850. All real-time measurements were made during that warming trend. That’s why new “record highs” should be expected until the warming trend ends. We probably will not realize the warming trend has ended until a cooling trend has been in progress for many years — an El Nino event, for example, could easily fool people with a temporary warming spike. It is one thing to predict what is likely to happen over the next 5 months based on what happened in 1998 with very similar drops in ENSO numbers. It is almost the same as predicting what will happen to temperatures between 2 PM and 10 PM based on what happened yesterday under similar conditions. But as for predicting what will happen in 40 years, well that is a totally different matter. Would you not agree with me that there is at least a 99% chance that 2016 will NOT set a record without “adjustments”? Do you know of any satellite temperature data that isn’t adjusted? I have no fault with anything specific in your article. I just thought your obvious intelligence could be put to better use than predicting a year when it is more than half over. All temperature data are “adjusted”, including satellite data. If the people working with the data are biased — NASA-GISS for example — you can be confident their “adjustments” will usually move the raw data toward their prior predictions — they own the climate predictions and the climate actuals = a conflict of interest. Very “Clintonian”. But to make you happy, I will agree that 2016 is not likely to be warmer than 1998 in the satellite records, but goobermint officials will say it was: THE HOTTEST YEAR EVAH — so hot you could fry an egg on a bald man’s head ! Apparently the only support for warming is from worthless climate models that never have gotten anything right despite twenty-eight years of trying to predict climate. This explains how they justufy their fantasy warming. Fact is that even in the presence of natural phenomena the temperature platform in the eighties and nineties remains horizontal, indicating presence of a hiatus as figure 15 in my book shows. But after the super El Nino of 1998 subsided a steep temperature rise took place. It started in 1999 and in three years raised global temperature by one third of a degree Celsius. This lifts all twenty-first century temperatures up by that amount above the eighties and nineties Result is a proliferation of “highest ever” global temperatures. Hansen was the first to notice that nine out of ten record global temperatures occurred during the first decade of the twenty-first century. His confirmation bias then went into action and he declared that greenhouse warming was responsible for it. Goes to show how confirmation bias over-rides science. To start a greenhouse warming in 1999 you must first inject additional CO2 into the atmosphere. This did not happen according to the the ice core extension of the Keeling curve. Likewise, to stop greenhouse warming in 2002 as as happened, you must pluck all those absorbing carbon dioxide molecules out of the air, an impossible task. The temperature trend of the twenty-first century did look horizontal to me in 2010 but when you extend your view to 2016 as we now are able to do we see that the global temperature is actually decreasing. Temperature dropped by approximately 0.2 degrees Celsius between 2002 to 2012 as best I can tell from Roy Spencer’s graph. That is a negative slope of -0.2 degrees Celsius per decade This cannot be explained by the greenhouse effect either. Most likely the initial warming, starting in 1999, was due to the large amount of warm water the super El Nino left behind as it departed. This means that no replenishment of warmth is possible and the entire mass of water must eventually cool down to background level. The question then becomes where it will end. If you linearly extrapolate the cooling slope to the right side of 20016 all of the warmth inherited from the super El Nino of 1998 will be gone. What follows swould then likely be an extension of the the hiatus of the eighties and nineties, currently hidden by the fake warming of the IPCC. Return of the PAUSE, if you like. Two of them sit right smack on top of the super El Nino of 1998. Something seems wrong, that is for sure! After this year, 1998 will be in a 4 way tie for ninth place on GISS and it will be in first place on the satellite data sets. Hopefully Trump gets in and cleans up the mess. Hottest ever? Not in Paris I can assure you. Took the kids’ rabbit to the vet this weekend for an annual check (watch those teeth carefully…). I was covered in fur as said rabbit is molting right now. Vet explained that this is very late in the year coz of the lousy spring. Told me she’s had several panic calls lately from other pet owners worried about their pets’ excessive hair loss. Nor here in Canada, where it looks like I’ll probably have to turn the furnace on tonight. In what should be the middle of the summer. Check the temps for 1980. Great heat wave that killed people left and right. So many they had to stack them like cord wood in the back of the ambulance that picked up Dead people that summer. The Mississippi was at it’s lowest point ever, in history. I know about stacking the corpses, my father ran it. The important difference is that the 1997/98 Super El Nino came from a lower base temperature (thus the uplift was greater) and it resulted in a long lasting step change in the satellite temperature data set of approximately 0.26degC. However, if the strong El Nino of 2015/16 merely results in a short term blip then matters will be difficult for AR6 since the pause will have reappeared and will by then be over 20 years in duration (probably over 21 years in duration). Presently we do not know whether the strong El Nino of 2015/16 will result in such a long lasting step change in temperatures or whether just like the strong El Nino of 2010 it will result in a short lived blip in the data set. That is very true. Predicting when the pause will return, if ever, is much more difficult than predicting what is likely to happen over the next 5 months given the ENSO numbers this year. IF, and that is a big IF, the temperatures follow 1998 over the next 3 years, the pause will probably be at least 10 months away, however I will not make predictions as to what will happen in this regard. I think that the reason why there was no further step change after the 2010 El Nino is that the climate shifted to it’s cool pattern around the mid 2000s. I would also think that for this reason there will not be an upward step change following this last major El Nino in the years ahead. Especially as the timing of the next solar minimum will accentuate the cooling from this still developing La Nina. I expect this La Nina too hold into mid 2018. My contention is the 97-98 upward step-change was more due to blunted La Nina 99-01 relaxation than magnitude of the 98 EN peak. The reason for a failure to fully relax back was the timing of those ENSO relative to the solar cycle. SC23 F10.7 (thus EUV) was on a steep upward climb in 99-00 as the tropical Pacific skies were generally clear of clouds with the suppressed convection inherent to LaNina conditions. This rising UV forcing prevented the system to return fully to its previous SST state. Currently we have steadily declining F10.7 as SC 24 winds down to its 2019-2020 min. SC24 was already on of the weakest SC of the last 100 yrs. If magnetic activity of SC24 weakens further, the length of time to minimum (and the start of SC25) gets extended. Thus a longer period with weak F10.7 values over the next several years enables tropical SST to drop further during any extended LaNina condions. Is a down-ward step coming? Forget the Pause. Hello global cooling. The alarmist camp definitely needs a short La Nina 16-17. If that doesn’t happen, and a downward step begins to take shape, then they’ll be praying to their climate god for a face-saving big volcanic eruption somewhere in that time period. Joel I am in complete agreement with you. 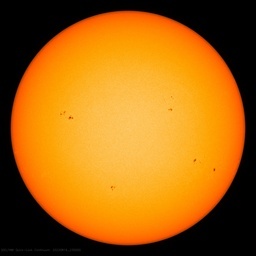 There is evidence however of major geological activity being associated with prolonged minimum solar conditions. I will not let the AGW movement use that as an excuse. Data seems to indicate this to be the case. This is what I meant to send. 1) La Nina occurring during solar increasing solar cycle as Joel indicated. 3) Stratospheric cooling from Mt. Pinatubo eruption. I really doubt the El Nino had anything at all to do with the step change. We essentially had a very active ENSO period in the 1990s which produced a lot of noise. This could easily have masked any small warming signal and hence the cause of that signal. Climate scientists totally misunderstand glaciers. They assume that all glacial melting comes from heat applied to the upper surface by air and sunlight. The fact is that the planet itself is a heat source. The evidence of this is that the temperature of the crust (away from tectonic boundaries) increases about 25° C per kilometer of depth. That heat moves outward (Newton’s Law of Cooling) until it reaches the surface and can be transferred to the air or water. As a result glaciers continually receive a considerable amount of heat from the ground they rest upon, enough to melt the ice. The temperature of the bottom of a glacier is always at the melting/freezing point. The pressure due to the weight of the ice melts the ice into a thin layer of water. The small amount of water this produces helps the glacier move more readily, just as a small amount of water between the blade of a skate and the ice allows a skater to move readily. Many people don’t even know about the 1982/83 edition: simply because it was sharply weakened by the El Chichon eruption, which led to a big increase of aerosols and consequently to a far weaker response of the temperatures in the troposphere. Granted, there are other additional measures some people use, but the strength of the 2015 ENSO should not be minimized. The smaller the interval chosen for a time series, the less it tells you. This is quite similar as when you build the integral of the series using the simplest method (mean * interval). So you compare the surfaces rather than the peaks. A trivial method to numerically integrate is to build the mean of function values f(x) over an x interval and to multiply that mean with the interval’s size. We aren’t doing complex math here, but simplest approximation. I would call the third strongest El Nino as still being strong, even though it wasn’t #1 or #2. I do not see your point as being valid. How many years will some persons need till they really understand that Paul Clark’s WFT no longer should be used as it is no longer maintained? By that simplistic argument, we should [not] use any datasets from the past that aren’t maintained because the researcher has moved on, died, or the instrument failed and is no longer operable. Anthony, I meant the use of Paul’s site for the present. 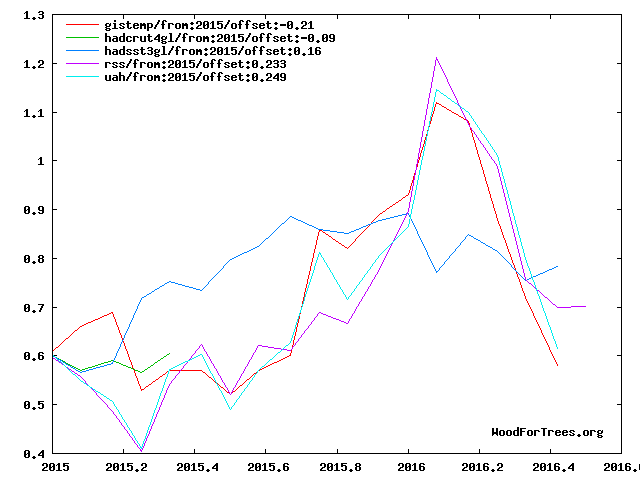 It is evident that for showing or comparing temperature time series up to around 2013, WFT remains an incomparably accurate instrument. which shows the newest RSS revision, but Kevin unfortunately did not integrate the newest UAH. I certainly wish it were maintained better! However it is still excellent for certain sites such as RSS, GISS and Hadsst3. But it cannot be used for Hadcrut4 unless you want a slope from 1950 to 1980 or something like that. You talk about the “older” TLT. But as you say, that is all we have right now. We almost never discuss the other products that are higher up in the atmosphere. And WFT never did have them. As for using certain products “with caution”, keep in mind that UAH6.0beta5 agrees very well with RSS3.3. All this talk about record warmth in the scheme of things will be proven to be meaningless. You and I may know this. But we have to counter the scary perceptions people get that just read the headlines. The ElNinos in 1997/98 and 2015/16 were very likely on the same magnitude. See the ONI-Index ( http://www.cpc.ncep.noaa.gov/products/analysis_monitoring/ensostuff/ensoyears.shtml ) in which the last ElNino was sligthtly stronger and the MEI Index ( http://www.esrl.noaa.gov/psd/enso/mei/ ) in which the 1997/98 ElNino was slightly stronger. Then compare Nino3,4 ( almost identical). No differnece in reality! Does this mean that the warmunists will finally be proven to be right and those of us who believe this AGW stuff is a lot of bull shift will be proven wrong? No, it means there is not much change over the last 18 years and that El Ninos are much more important than CO2. The bar graphs reflect that in 1998, El Niño peaked late in the year, while in 2016, El Niño peaked early in the year. We will most likely see a resumption of the cooling trend that began in 2003, but with acceleration as the Sunspot cycle continues to head towards Zero. We have already had periods of days with ZERO sunspots, so cosmic rays are reaching the Earth in impeded, making additional Cloud Cover, and cooling. See new Paullitely.com post from India News. More data from the past which shows this period of warmth is NOT unique. I am going to keep harping on this to expose how misleading the AGW enthusiast when presenting their case to the public. 1. Past history shows this period in the climatic record is not unique. 2. Past history shows that each and every time solar enters a period of PROLONGED minimum solar activity the global temperatures have responded down. I have listed the criteria (in the past) which was last met in the period 2008-2010. With that said I think there is an excellent chance of this criteria being met presently and this time the duration could be much longer. 3. There is a GHG effect but I maintain it is more a result of the climate/environment rather then it being the cause of the climate. 4. If one looks at the climate just since 1950 -present(to take a recent period of time) and factors solar, volcanic activity, global cloud cover and ENSO versus resultant temperature changes one will find a very strong correlation. 5. Temperature data of late must be met with suspicion. I maintain satellite temperature data is the only valid temperature data. Remember if global cloud coverage should increase and snow coverage/sea ice coverage should increase in response to prolonged minimum solar conditions that would accomplish the albedo to increase. Even a .5% to 1% increase would wipe out all of the recent warming. Albebo is hard to change and at the same time it takes very little change in it to have climatic effects. It is similar to Ice Age conditions versus Inter-Glacial conditions; hard to go from one regime to the other but at the same time the change required is very minimal. It is a balancing act which most of the time is in balance but every so often factors conspire to throw it out of balance which we know when we look at the climatic history of the earth. CLIMATIC HISTORY – which is totally being ignored by the AGW movement has to be kept in the forefront and I am going to do that each and every time I combat their notion that this period of time in the climate is somehow unique. The globe got warmer. The NCEP/NCAR global anomaly rose from 0.369 in June to 0.413 in July. I expect the land datasets to also have risen in July as well. Nino34 temperatute has stopped dropping, and everybody (Jamstec/Scripps/ECMWF/CFSv2) has backed off their previous predictions of a monster La Nina. Here are the Nino34 anomalies for the last 7 weeks. The dates are the Wednesday the week is centred on, and the data are available the following Monday. E.g. the data for the week centred on Wednesday 2016/08/03 was available for download Monday 2016/08/08. A quick calculation shows that UAH would have to be 0.342 or lower and RSS 0.379 or lower, averaged over the next 5 months. UAH looks like it has a shot at doing so. RSS would need a significant drop to get below the bar. What’s surprising is that the land data sets currently have longer “negative slope strings” than the satellite sets. As of June’s data, HadCRUT and GISS went back to September and NCEI to October of 2015. UAH and RSS were only to December of 2015. Even with July data, UAH and RSS “negative slope strings” only go to November. Nino34 temperatute has stopped dropping, and everybody (Jamstec/Scripps/ECMWF/CFSv2) has backed off their previous predictions of a monster La Nina. My calculations basically assume that what is in the pipeline already will greatly influence the next several months. What happens in a year from now is anyone’s guess. With more or less steadily declining ENSO values, July seems to have been a fluke, but time will tell. The problem is that skeptics have fallen into an epistemological trap: you argued “the pause” should cause us to question warming, and now that it is over, you do not honor the epistemology by saying the end of the pause, and historic highs should cause us to entertain warming. Everything is a sign of no-warming, the reciprocal of the people who argue that everything is a sign of warming. Likewise, we hear the “warmer is better” argument, which when expanded is the “the earth isn’t warming, but I wish it was!” That is like neo-Nazis who argue that “Hitler didn’t orchestrate a Holocaust, but we wish he did!” It betrays the lack of clear thinking. It betrays the lack of clear thinking. Many arguments can and have been made to make the point that we do not have to spend billions to save us from catastrophe. The pause was convenient and easily understood. I could now say there has not been statistically significant warming at the 95% level for satellites for 23 years. However many people’s eyes might just glaze over with this statement. In the era of manmade CO2, since 1940, we have had a negative correlation of CO2 and average temperature from 1940 to 1975, a positive correlation from 1975 to 2003, and a flat trend from 2003 to 2015. And those three different trends, within 75 years, clearly shows anyone who claims CO2 levels control the average temperature is just stating an unproven opinion. The downtrend from 1940 to 1975, and the flat trend from 2003 to 2015, should not have happened if CO2 was the “climate controller”, or just the major cause of climate change. A +1.0 degree (+/- 1.0 degrees C.) warming since 1880 is proof of nothing, and also an unusually stable temperature for our planet. Your attempt to bash skeptics falls very flat when Hitler is mentioned — you should be ashamed of yourself. The lack of clear thinking, or any thinking, is your problem, not the problem of climate change catastrophe skeptics who post article and intelligent comments on this website. We have listened to wrong climate forecasts for 40 years … and we know BS when we hear it. Plus, the increase in CO2 since 1998 has been record setting. That should have certainly led to a clearly visible warming in the record. Afterthought 1035am: your nazi comparison is merely disgusting. Can’t say I like it much myself either…. Oh no, not the Nazi argument. The pause does not allow us to question warming. What it did was allow us to question the prediction of CAGW. Basically the prediction was that if there were no warming for 18 or so years, then CO2 was not a significant driver of global warming. So it allowed us scientists to sort out natural warming from CO2 generated warming according to the model array. Although there is a fairly broad church on this site, a working hypothesis, the null hypothesis, is that there is no difference between the rate of global heating now that we have added a lot of CO2 to the atmosphere, and what would have occurred naturally. As the CO2 proponents predict high rates of warming, which have not occurred, then one could hypothesise that CO2 is causing a dampening of global warming as according to them, all other aspects of climate change are understood and don’t cause heating. You know, ‘the science is in’. ‘historic highs’ don’t cut it as the history is very recent in climate terms. The long term cooling from the Minoan period is what mankind needs to worry about. So that is the interest. The trap is not to understand the argument. we are pretty lucky to be in this time and period of warming? for example, sprinkle the ice with carbon[!~!~!] dust to stop the deflection of incoming heat. Did you get that howler from the Potsdam Gestapo, too? was not much less disgusting and there wasn’t any reaction on it. I myself didn’t, as the comment around simply was too stupid to be answered to. Looks like I’ll have to add gestapo to the list of trigger words. May people living in Germany lost their parents due to torture until death in the Gestapo’s cellars. But dictatures and torture exist everywhere. To that I’m afraid there won’t be any change in the next centuries. my data sets show we are cooling. I figure the reason why the satellites do not pick this up is because whatever it is that they are measuring with, cannot stand current solar irradiation. hence, they are giving faulty readings…. even minima are falling at -0.01K / annum….contrary to AGW theory! The strangest things can happen with relatively few sites over relatively short time periods. As for the accuracy of the satellite readings, that is beyond my pay grade. I prefer to discuss things where I know what I am talking about. – RSS: published 0.131 °C / decade; computed 0.130 ± 0.008 °C. These two institutions unlikely will produce and publish, for their own temperature time series, trends lacking the necessary statistical significance. – RSS: 0.108 ± 0.016 °C /decade. I know that for example Nick Stokes and Kevin Cowtan produce, out of the same sata, trends with a much higher 2σ interval, partly due to autocorrelation. But Kevin Cowtan for example explains this be due to a greater uncertainty, in turn due to a greater deviation of the data from the computed trend. That uncertainty grows as the time interval becomes smaller. Thus, as long as a qualified mathematician and statistics expert does not formally falsify my opinion, I pretend that we observe since 1993 very well a statistically significant warming of about 1 °C per century. That’s not much at all! But significant it is. Simply the result of noise in the data. No warming signal exists. I must humbly confess: often enough I forget to mention my sources as you did right here. Nevertheless it is quite easy for anybody to “go behind” the picture you show us. It is very interesting to detect that though the picture clearly is accessible from this WUWT thread, no page of the site “sealevel.info” I inspected using the browser’s “View page source” seemed to contain even the word “Santer”, let alone “Santer_2014-02_fig2_graphC_1_100pct”. Even a global Google search over the whole planet fails! But there is, in your comment, a much more interesting background I’ll need somewhat more time to answer to. Should Bob Tisdale be watching this thread, he would perfectly anticipate what I mean! Good comments RichardM – please see my similar note below. Maybe there was some real global warming before 1982 due to the Great Climate Shift of ~1976, , but it is possible, even probable, that there was no “real” global warming since 1982 – there was only “apparent” warming, which was caused by the temporary cooling of global temperatures by the two volcanoes El Chichon in 1982 and Mt. Pinatubo in 1991. The slope of the blue line, which is UAHLT calculated from the Nino3.4 Index, shows absolutely no average warming since 1982. The slope of the red line, which is UAHLT actual, shows an average warming rate of 0.13C per decade. August 8, 2016 at 3:59 pm: people without an axe to grind who understand climate, know about cycles. 1993 to now, started near the middle of a net oceanic warming trend with ENSO release to a peak. Followed by the start of cooling, led by PDO to be followed by AMO just started. This initial rise, tailing off into the top of the curve and starting to fall, can show the deception of using trendlines selectively on waveforms. Mere childish games, when we are looking at medium term solar integral effects of all wavelengths on a largely watery world.. Significant? Not climatically. But as I manifestly did not clarify enough, I expect here all but smalltalk. Plus/Minus 0.8c averaged globally is extreme either way, doesn’t everyone think so? I start to chafe at anything over or under 0.5c variance on a daily basis. … doesn’t everyone think so? Sure? Please read Brozek’s guest post, and earlier revisions of it, easy to find. Please read Brozek’s guest post, and earlier revisions of it, easy to find. If any one wishes to see almost all of my posts type “now includes” into the WUWT search bar. August 9, 2016 at 1:28 am: Bye bye, troll. Your 3 month average for July to September is 0.357. My average for the third quarter was 0.301. That is only a difference of 0.056 over 3 months or 0.019 per month. We are certainly in the same ball park! Being in the middle of the fourth quarter, November should be close to my fourth quarter average which it is at 0.092. With up to November in the pipeline so to speak, no record seems possible for 2016, regardless what ENSO does now. This rather an outsider, a bit away from Werner Brozek’s stream. Sometimes you feel need to answer to what you don’t consider be correct. Well, when I look at the source from which Richard M’s picture was originating (Santers publication in Nature Geoscience in 2014), I’m not quite sure he’s right. 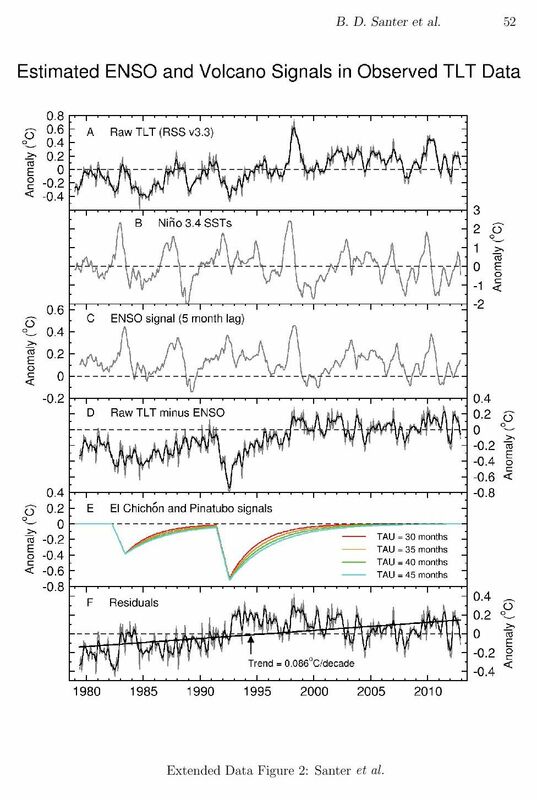 The residual warming resulting in the RSS TLT data after removal of ENSO and volcanoes still is, for 1979-2013, at 0.086 °C / decade compared with about 0.124 °C (at end 2013; went up to 0.130 inbetween due to the actual El Niño). I don’t think that be “no warming signal”. But much more interesting (from my point view of course) would be to give us not only ‘raw minus ENSO’ but also ‘raw minus volcanoes’, what would have shown us how TLT and surface behave when no huge volcano induced TLT cooling happens. 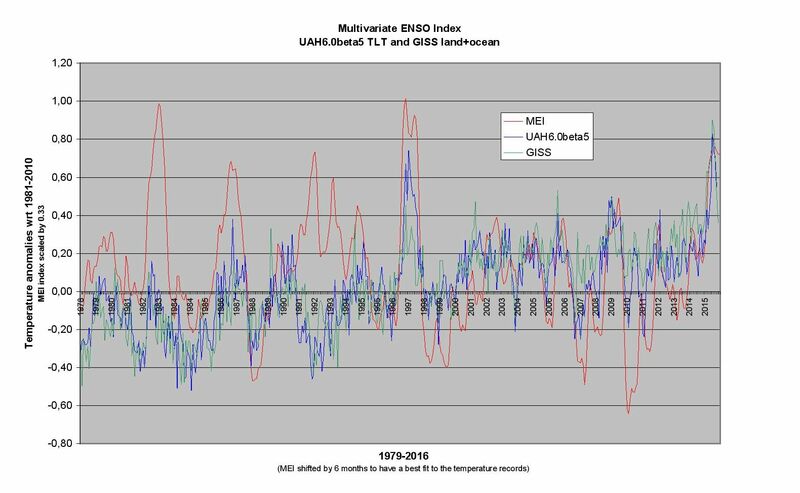 You see the MEI (Multivariate ENSO Index) together with UAH6.0beta5 TLT and GISS land+ocean (MEI was scaled by 33% and shifted by 6 months to offset size difference and time lag between ENSO signal and temperature anomalies). – ENSO 1991 and even negative anomalies for both TLT and surface (Pinatubo, VEI 6). Sorry Allan: I couldn’t see that plot in any of your WUWT comments.